We want to help you keep your eyes healthy. That’s why we recommend an annual eye exam for all of our clients. 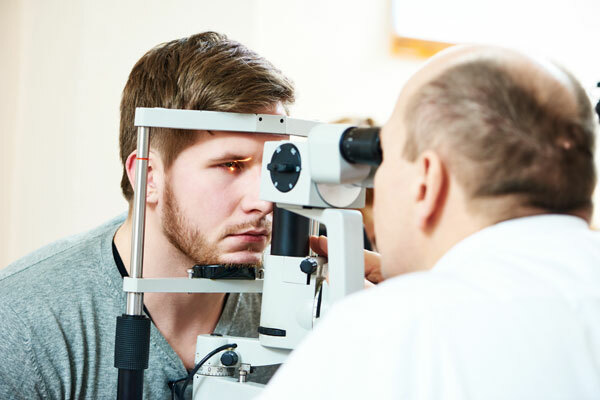 Coming in routinely gives us the chance to monitor your vision’s history and respond immediately to areas of concern. Simple diagnostic procedures may reveal common problems, but we are also able to provide specialized tests for patients with complicated circumstances. We often also look for problems in other areas. We identify vision problems with children and adults that suffer from development problems and help victims of accidents that have suffered physical damage to their eyes. We can use the information we find during your exam to develop a plan to correct the problem. A comprehensive eye exam can take up to an hour. All of our tests are painless. Most of our evaluation techniques involve only simple charts and visual inspections, but some clients find certain procedures to be uncomfortable. Tests for diseases, like glaucoma, often require us to bring a measuring device within a very close proximity to your eye. Our optometrists are confident in their abilities and work quickly to achieve results while minimizing your discomfort. We are also outfitted with advanced equipment including Optical Coherence Tomography(OCT), Visual Fields, Visuel Evoked Potential(VEP) Pattern Electroretinography (PERG), and Corneal Topography. This equipment allows us to map, measure and most importantly compare to norms, parts of your eye assessing damage due to diseases including glaucoma, macular degeneration and trauma. Many times we can find changes before you notice them. Schedule your eye exam today by calling our office at (703) 578-3600. Start working with us, and we will help you maintain your vision for years to come.